After a few years where its competition was beginning to find some championship success, Team Honda started the 1996 season back in its old dominant form. The Red Riders crushed it for most of the season, and the most impressive part was that the team featured just two riders: Jeremy McGrath and Steve Lamson. They were entrusted to go out and win both the 250 and 125 National Championships. 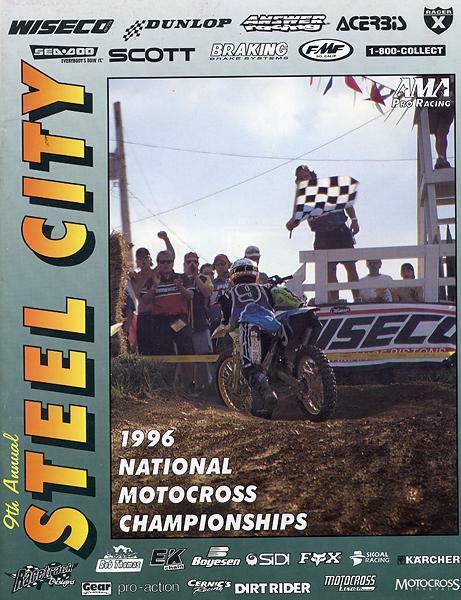 Although Ryan Hughes' unforgettable moment as a racer came to close the '95 season, the photo ended up on the cover of the '96 Steel City program. Over the past few seasons, Honda lost Doug Henry to Yamaha—if he was ever going to make it back from his back-breaking crash of June '95—and Jeff Stanton to retirement. They didn’t replace them, but it didn’t look like they needed to. Around them, however, change was everywhere. McGrath’s 250 motocross rival from the previous year, Jeff Emig, switched from Yamaha to Kawasaki. Yamaha brought in the back-from-retirement Damon Bradshaw. And Suzuki’s efforts to find its old glory—with Roger DeCoster at the helm—looked good with Greg Albertyn back for his second U.S. season and Mike LaRocco, the ’94 250 National Champion, going yellow too. Lots of changes, but it mattered little to McGrath. 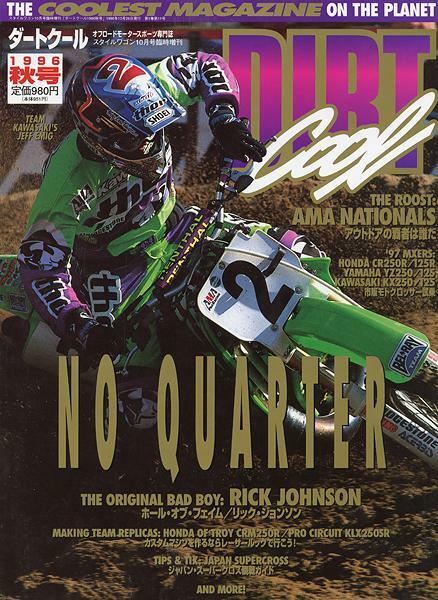 MC was in his prime, and the King of Supercross put together the best indoor season of his career, winning the first thirteen rounds of the series and threatening a perfect season until Jeff Emig halted the streak in St. Louis at the fourteenth round of the fifteen-race series. McGrath recovered quickly to win the final round, giving him a record-shattering fourteen wins in a single series—a record he still shares with Ricky Carmichael. 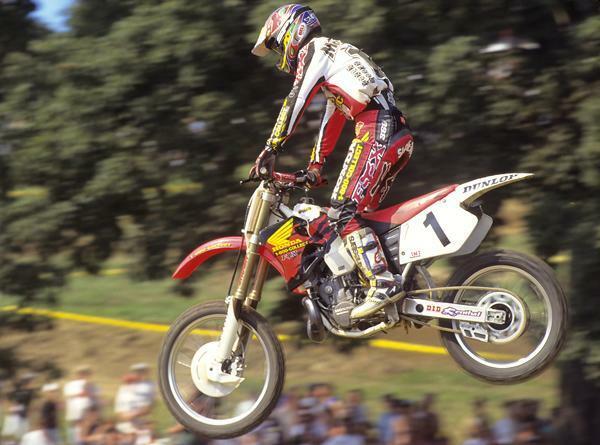 Jeremy McGrath was a dominant force in AMA Supercross, and he very nearly won the AMA Motocross title again in '96. At one time, McGrath wasn’t known for his outdoor motocross skills, but by ’96, he was as fast as anyone on the planet outdoors. In fact, in the midst of his SX run, he also won the first three MX races of the season. Finally, at High Point, he showed some cracks, falling back to fifth in the first moto while admitting he just wasn’t motivated after racing and winning for about five straight months. Albertyn broke through for his first U.S. moto win but crashed out late in the second moto to throw away a certain overall. McGrath recovered to win the moto, but Emig collected the High Point overall with a pair of consistent finishes. The fans started calling Emig “Streak Breaker” for having ended yet another McGrath run. Emig stepped up his game and challenged McGrath each weekend, but MC was still holding a big points lead—until Millville, when McGrath tried jumping a massive table-to-table double and cased it, spraining his foot badly. He could barely ride and struggled to score top-ten finishes. Emig went 1-1 and began an impressive streak of holeshots and wins—he was coming on strong just as McGrath faltered. Jeff Emig chased after McGrath all summer long in AMA Motocross, then beat him on the last day of the '96 series to win his second career title. McGrath pulled off at Washougal (a move he today says is one of the biggest regrets of his career) and surrendered the points lead to Emig. He came back to go 1-1 at the next-to-last round at Binghamton, setting up an amazing championship finale at Steel City. Emig led the points by just two going into finale—essentially, whoever won the race would win the championship. 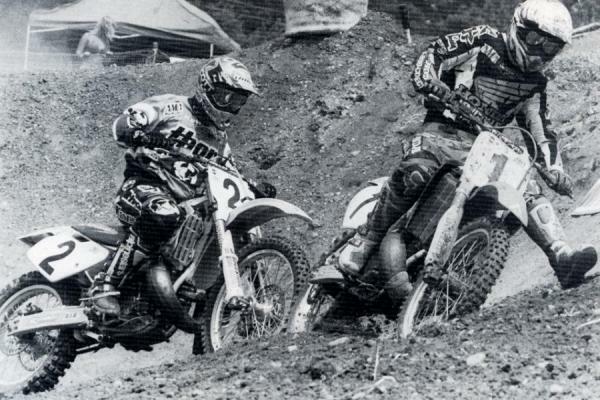 Steve Lamson was almost as dominant in the 125 Nationals as his teammate McGrath was in AMA Supercross. The McGrath and Emig rivalry was a strange one. At times they were fierce rivals; at other moments they would party and hang out together (the sport had come a long way from the “super training” era of the 1980s). Famously, they could park their boats next to each other at Lake Havasu and hang out all day without ever really making eye contact. Heading into Steel City, McGrath seemed to hold the upper hand, as he usually came out on top of one-on-one battles with Emig, and he had said Steel City was his favorite track on the circuit. Emig is flanked by Ryan Hughes and Damon Huffman on the '96 Team Kawasaki squad. What followed was thirty minutes of nail-biting battle, with McGrath applying pressure and Emig riding flawlessly to win the moto and hold a significant five-point edge into moto two. Again, Emig grabbed the holeshot and rode a flawless race, while McGrath got a bad start and never challenged him. In one of the sport’s best-ever showdowns of star power in its prime, Emig toppled McGrath to collect the 1996 250 National Championship. Lamson rates as one of the all-time great 125cc motocross racers, but he somehow managed to never win a Supercross in either class. McGrath’s teammate Lamson didn’t have such trouble in the 125 class. He was challenged at times by Yamaha’s old-and-young 1-2 punch of John Dowd and Kevin Windham but his points lead was never in danger. Late in the year, though, Windham began to really find his form, beating Lamson straight-up at the final two rounds. 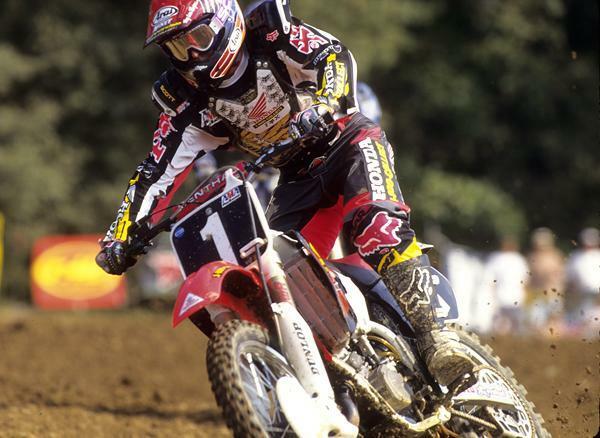 But Windham would have to wait until 1997 to run for the title, because Lamson had already wrapped up his second straight 125 National crown—with nine wins, he won by a ridiculous 129 points! Emig cuts in under McGrath on the old off-camber wall at Budds Creek. 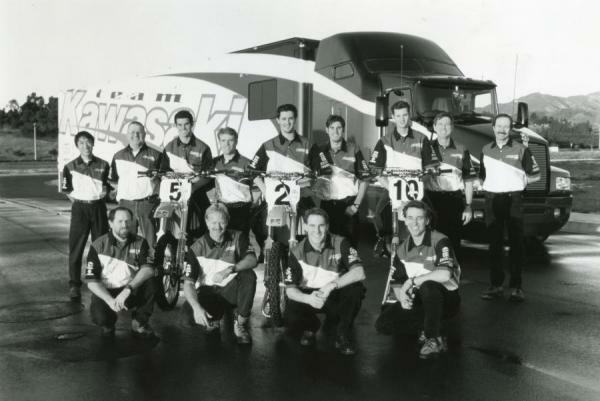 Team USA had slipped from its unbeatable perch at the Motocross des Nations, losing the event to Britain in 1994 and Belgium in '95, but the Yanks returned with a vengeance in 1996. McGrath, Lamson, and Emig (riding the same KX500 that seemed to be deployed with a different rider each year) absolutely dominated the race in Jerez, Spain, winning their classes and reclaiming glory for the stars and stripes. Other efforts back home weren’t going as well. Bradshaw had a decent but unspectacular season and was nowhere near the same rider he was four years earlier. Henry won a moto at Washougal to the delight of the fans but was generally a non-factor. Yamaha dropped Bradshaw for 1997, and they announced that Henry would ride an experimental four-stroke bike in the ’97 nationals. What the heck was that all about? Suzuki’s rejuvenation effort fell short. Albertyn finally won an overall at Unadilla but still crashed too often to challenge Emig and McGrath. And LaRocco wasn’t gelling with the radical new RM. Suzuki’s 250 team would pick up a huge new star for 1997. So would the entire 125 class. Stay tuned for more tomorrow. 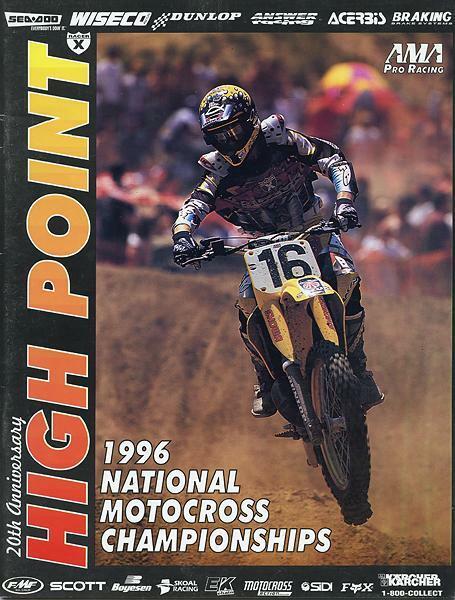 That's Greg Albertyn on the cover of the '96 High Point program.